Fire protection for data and media. Burglary protection to European Standard EN 14450. Digital, audit and time lock options. High level burglary protection available to grade 5. When investing in fire protection for magnetic data, digital data or paper documents it is essential you get advice from a qualified media protection expert. The requirements of EN 1047-1, EN 1047-2 and EN 15659 include fire endurance tests in the course of which the temperature increase in the interior of the secure storage units is measured. Additional fire shock and impact tests are carried out on data cabinets to simulate falling structural components (e.g. of the ceiling) on to the product in the event of fire. 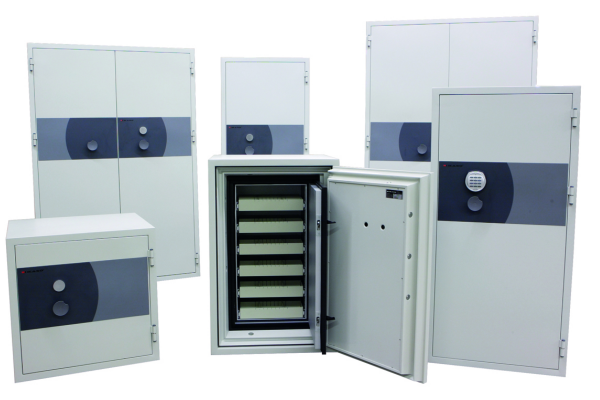 The additional impact test made on type B data rooms and data containers is used to determine a specific level of mechanical security. In type A data rooms, mechanical protection is already provided due to their design and construction.